There are so many amazing reasons to use EXER-GENIE® – the No. 1 Isometric Exercise Machine. Its portable size, proven track record, quality American workmanship, and rich history are just a few. Which reason is most important to you? Your time is important. With a portable isometric exercise machine, you can get a full body workout in as little as 10 minutes – targeting every major muscle group with an EXER-GENIE®-specific exercise routine. Or, isolate and target specific muscle groups to increase strength, stamina, and muscle definition. A good a portable Isometric Exercise Machine is versatile and small – offering a full range of fat-burning, muscle-building exercises in a tiny but potent package. We’re all about working smarter, and EXER-GENIE® is the smartest, most cost- effective, and most portable piece of exercise equipment you can buy. With the potency of a full gym in a travel-friendly package, never worry about bulky, expensive exercise machines again. In testing the EXER-GENIE® Exerciser, Scientists, Researchers and Coaches discovered that resistance was generated by winding the specially woven nylon training line around the smooth chrome plated metal shaft. Adjusting the resistance was easy and in a few seconds one could go from ounces to hundreds of pounds. Pulling on the training line not only controlled the speed at which a movement was trained, but also provided resistance that was proportional to the kinetic chain of the movement. Dynamic Life Movement Exercise was a major discovery! Training muscles through the movement equaled greater performance and Efficiency in Exercise™. Isotonic Muscular contractions are those movements based on lifting a constant amount of weight through a range of motion. Isometric Muscular contraction against resistance is where the muscle fires but there is no shortening of the muscle and no movement at a joint. The benefit of isometric exercises are that they can be used for rehabilitation as well as general strengthening without placing stress on the joints. Some sports require a high level of static muscle strength; Gymnastics, Yoga, Rock Climbing, Downhill Skiing as well as holding a child, for example, all have isometric strength requirements. Isokinetic Muscular contraction pertains to an exercise providing variable resistance to a movement at a constant speed with the assistance of specialized equipment. In isokinetic exercise, you maximize the resistance placed on the muscle throughout the full range of motion. The benefit of Isokinetic Exercise is the ability to train movements not just muscles. This type of training allows for greater strength, flexibility and elasticity gains more efficiently than training one muscle at a time. At the time the EXER-GENIE® Exerciser was being developed, experiments were being conducted by many exercise Physiologists, Trainers and Coaches throughout the United States, Canada and the world over on the application of the EXER-GENIE® Exerciser for injury prevention, functional training and functional performance enhancement. The EXER-GENIE® Exerciser provided for the first time in the history of exercise a practical, economical, efficient and highly effective way for anyone at any age to get fit and stay fit. Our program has been used by thousands of High Schools and Colleges, Rehab Clinics, Functional Training Centers, Sport Performance Centers and hundreds of thousands of individuals looking to improve their Functional Fitness and Performance. Professional Teams such as the Green Bay Packers, Dallas Cowboys, Minnesota Vikings, Seattle Seahawks, Oakland Raiders, San Diego Chargers, Golden State Warriors and many others have made the EXER-GENIE® Exerciser an integral part of their Functional Training and Injury Prevention Programs. 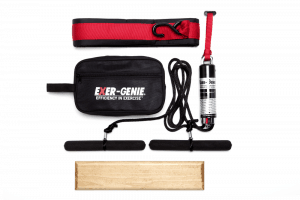 With the use of Space Age Materials and the newest design techniques the highly publicized EXER-GENIE® Exerciser has been improved and is widely known simply as EXER-GENIE®. The improved model uses high impact, high temperature resistant plastic for the casing. An improved resistance dialing mechanism allows the unit to adjust from ounces to hundreds of pounds of resistance and back in a matter of seconds. With the improvement in construction and design comes a new formula in the training line. A scientifically woven nylon training line allows for smooth operation at any resistance setting with exceptional durability.